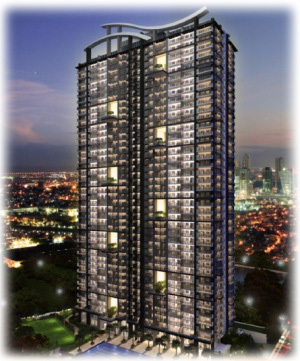 Sheridan Towers is the latest two-tower resort residential condominium development by DMCI Homes along Sheridan Street, Mandaluyong City. THE PROPERTY arm of DMCI Holdings, Inc., plans to take advantage of the growing business district in Mandaluyong City and build a resort-themed condominium there, an official said late last week. “We will be building a resort-inspired condominium on the Sheridan lots,” Cherrie Lyn V. Cruz, DMCI Project Developers, Inc. (DMCI Homes) marketing manager, toldBusinessWorld in a telephone interview last Friday, referring to three properties along Sheridan Street in Mandaluyong City, which the firm acquired from Swift Foods, Inc. for P500.22 million in March. “It will be similar to our other developments like Tivoli Garden Residences and Flair Towers. However, we’re still in the pre-development planning stage, and there is no construction movement yet as we’re still doing feasibility studies,” Ms. Cruz said. The three lots are currently occupied by the old warehouse facilities of Swift Foods and will eventually be demolished to make way for the planned condominium, she added. DMCI Homes said the Mandaluyong City was chosen because of plans to develop the industrial district into a future business center. “The area will be part of the future Mandaluyong CBD (central business district). There is a local government plan where the Ortigas CBD will be extended, spilling over to the Sheridan-Reliance [streets],” Ms. Cruz said. The project is expected to be unveiled by the fourth quarter, but with no definite month yet in mind, Ms. Cruz added. DMCI Homes, Inc. will launch four more projects for the rest of the year, after two launches early this year. DMCI Homes is allocating P8 billion in capital expenditures for its projects for the year. After launching One Castilla, and Torre de Manila recently, DMCI is launching Serissa this month, to be followed by Vera Woods in Taguig by October, according to DMCI project development head Alma A. Florendo. “There might be two more,” added Florendo, referring to a project called Sheridan in Mandaluyong. This brings to six DMCI Homes’ projects for the year compared to five last year. The company’s focus remains on the middle-income segment of the market, though focus has somewhat expanded to the upper-middle income segment from the original focus of low-middle. DMCI Homes sees a lot of opportunity in this segment which is still underserved. DMCI Homes will continue to focus on its residential business before considering diversifying into other property-related ventures. DMCI Homes however has tested the waters in the tourism-estate segment with its Alta Vista de Boracay project. The 2.7 hectare development atop a hill, overlooking Boracay island’s terrain, features 17-villa type residential structure that sold as a condotel property. DMCI Homes is eyeing to increase its sales by about 20 percent this year after P18 billion in reservation sales last year. The previous years, DMCI Homes has averaged sales of about P14 billion, according to Austria. MANILA, Philippines – Swift Foods Inc. is selling P500 million worth of property located at its headquarters in Mandaluyong City to DMCI Project Developers Inc. In a disclosure to the Philippine Stock Exchange on Friday Swift said its board approved the sale of three parcels of land on Sheridan St. with a total area of 11,116 square meters at P45,000 per sqm. The sale is in line with Swift’s efforts to pay down its debt. Based on earlier filings with the local bourse, Swift said it would pursue the sale of non-performing assets to settle outstanding obligations. Despite its liquidity problems, Swift management said it would continue to find ways to address pressing matters. Only its farm in Palawan will remain operational and continue to produce quality Swift Sariwanok chicken, Swift said. Swift incurred a net loss of nearly P70 million in the nine months ending September 2011, slightly higher than the P68.9 million loss recorded a year before on lower sales. Net sales slid 33 percent to P304.34 million. In the third quarter of 2011 alone, Swift’s net loss amounted to P12.35 million or a decrease of 75.5 percent from the P50.38 million posted the previous year. Revenues dropped 43.1 percent to P86.2 million due to the suspension in operation of Bulacan and Rizal farms which resulted to low production volume. SWIFT FOODS, Inc., has moved to sell three lots in Mandaluyong City worth P500.22 million to real estate firm DMCI Project Developers, Inc., a disclosure to the Philippine Stock Exchange on Friday showed. Following a board meeting, the company’s board of directors reportedly authorized the sale of three parcels of land along Sheridan St. to the Consunji-led developer. The three lots, which are covered by transfer certificate of title numbers 136988, 22622, and 22623, have a total land area of 11,116 square meters (sq. m) valued at P45,000 per sq. m.
DMCI Project Developers, a wholly-owned unit of listed DMCI Holdings, Inc., currently has 26 housing developments located in Metro Manila, Rizal, and Boracay. The property developer already has two projects in Mandaluyong City: the three-tower Dansalan Gardens on Boni Avenue, and the five-tower Tivoli Garden Residences on Coronado St. Swift Foods, for its part, was incorporated in 1994 to assume RFM Corp.’s business of manufacturing, marketing and distributing processed and canned meat products, poultry products, and commercial feeds. The company posted another net loss for the January to September period last year worth P69.91 million. For Model Unit Viewing Appointments, Unit Reservations, Sample Computations and Email Inquiries please call (02) 966 2609, text +63917 822 3624, or e-mail us here!